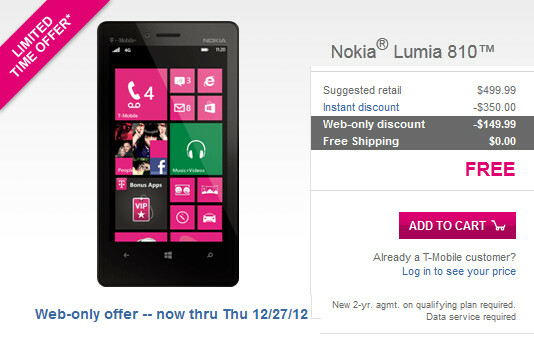 The Nokia Lumia 810 is a mid-range Windows Phone 8 model that can now be yours for the low, low price of zero, thanks to a special offer from T-Mobile. The nation's fourth largest carrier normally sells the phone for $149.99 on contract, but if you put your John Hancock on a 2-year contract, you can get the phone for free. Interested in the deal? Better not procrastinate, because once December 27th ends, so does this bargain. And by the way, this price is available only on the web. Run into a T-Mobile store and ask for a free Nokia Lumia 810 and they're likely to send you on a motorcycle counting all their cell towers (one, two Kalamazoo, three, four Jersey Shore, etc.) without Carly. 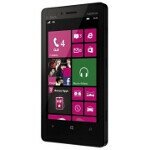 Revisiting the specs on the Nokia Lumia 810, which is an exclusive to T-Mobile, the device offers a 4.3 inch AMOLED screen with 480 x 800 resolution (WVGA) which works out to a pixel density of 217ppi. Driving the device is the dual-core 1.5GHz Qualcomm Snapdragon S4 Plus MSM8960 processor with the Adreno 225 crunching the graphics. 1GB of RAM is on board and 8GB of native storage is included. This can be expanded through the use of the 32GB capacity MicroSD card. The 8MP shooter on back captures video in 1080p at 30fps while the 1.2MP front-facing camera is adept at snapping self-portraits. The 1800mAh battery can be recharged wirelessly if you pony up for the optional wireless charging kit. Nokia Drive allows you to hear free turn-by-turn navigation with traffic alerts and speed limit warnings for up to 166 countries and 50 languages. Nokia Transit gives you info on public transportation. The difference between the Nokia Lumia 810 and the Nokia Lumia 820 is the lack of LTE connectivity on the Lumia 810 (no LTE for T-Mobile, of course), the slightly larger battery on the T-Mobile model (1800mAh vs. 1650mAh), and the larger capacity microSD slot on the Nokia Lumia 820 (64GB vs. 32GB). There is also a difference in the sensor on the front-facing camera which is 1.3MP on the Nokia Lumia 810 and .3MP on the Nokia Lumia 820. Got this phone a month ago at Target for $60.00 and luv it! I knew this day would come, but it was time to replace my HD2. Actually the best varient of the Nokia Lumia 820, best battery best microSD capacity and best ff camera out of all the versions. Yes it may look plain looking, but I actually dig the exterior looks vs the Att/Verizon version. This is coming from somebody w/ a GS3/Nexus4 daily driver combo. I just got one. It looks great with the optional cyan battery cover.